Watch performers dancing the Tango in the street (for tips) while enjoying a beer or two in one of the many cafes. 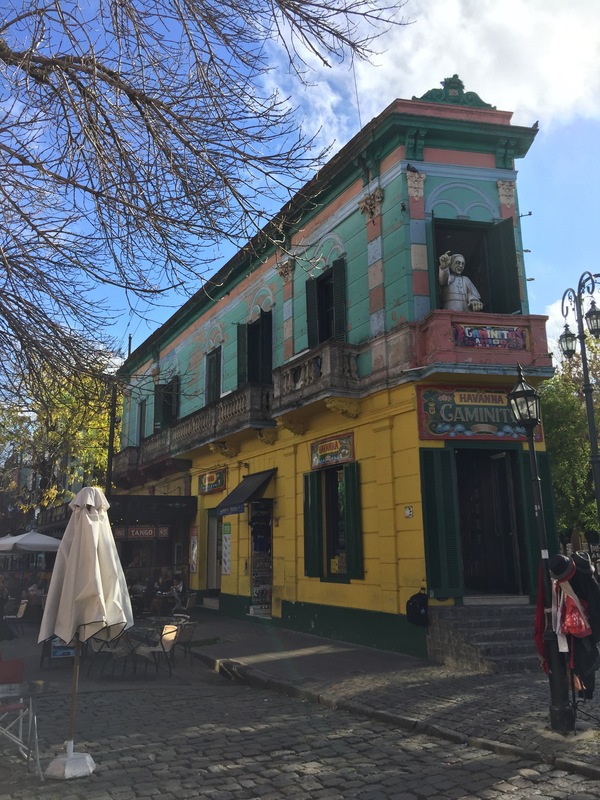 Buenos Aires has been called the Paris of the south, and it’s not surprising with its abundance of stunning colonial era buildings. The central Av. 9 de Julio road, runs through the centre of downtown Buenos Aries where you can find the Obelisk and welcome to BA sign. Make sure to visit at night as well when it is illuminated in pinks and purples. 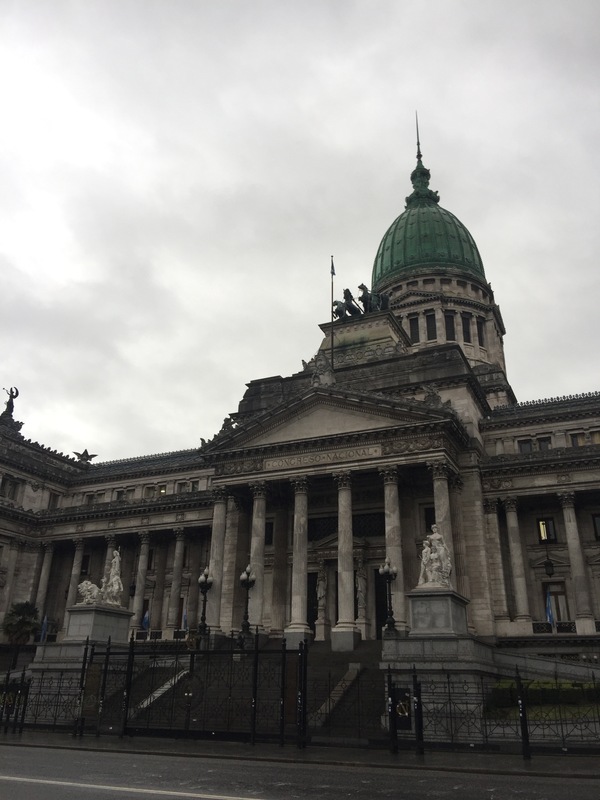 The grandiose National Congress Building is just a few minutes walk at the western end of Avenida de Mayo. As of May 2017 the plaza is undergoing significant improvement works so unfortunately photos of the plaza are slightly spoilt but don’t let it stop you paying a visit for the architecture. 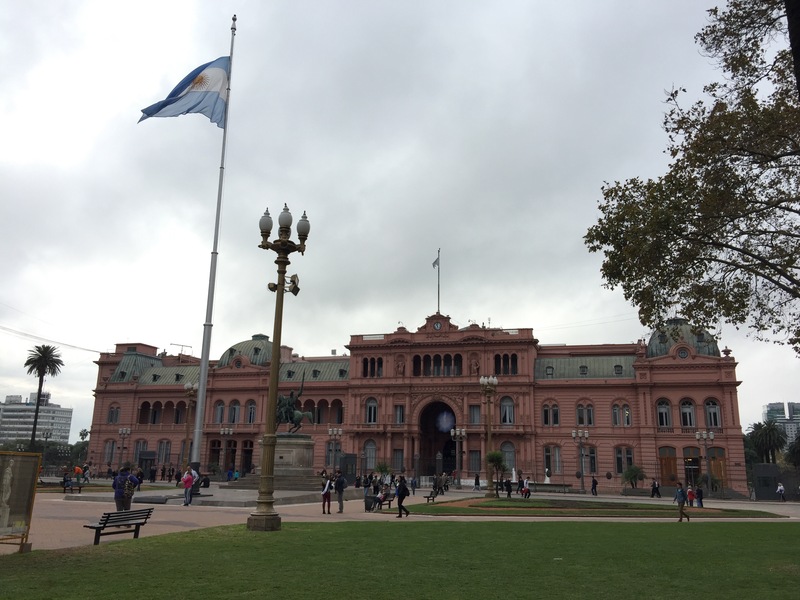 Make sure you take a walk all the way around to get sights of possibly the largest Argentinian flag in the capital which is located in the rear courtyard. The Plaza itself is a little scruffy with steel barriers, anti war banners and homeless people but these don’t stop you walking right up to the front gate. If you’re lucky you may also catch a glance of the changing of the guard as they march across the street and enter the grounds. Visiting a cemetery may not be top of everyone’s things to do list but the Recoleta Cemetery with its ornate mausoleums is a highlight of Buenos Aires. 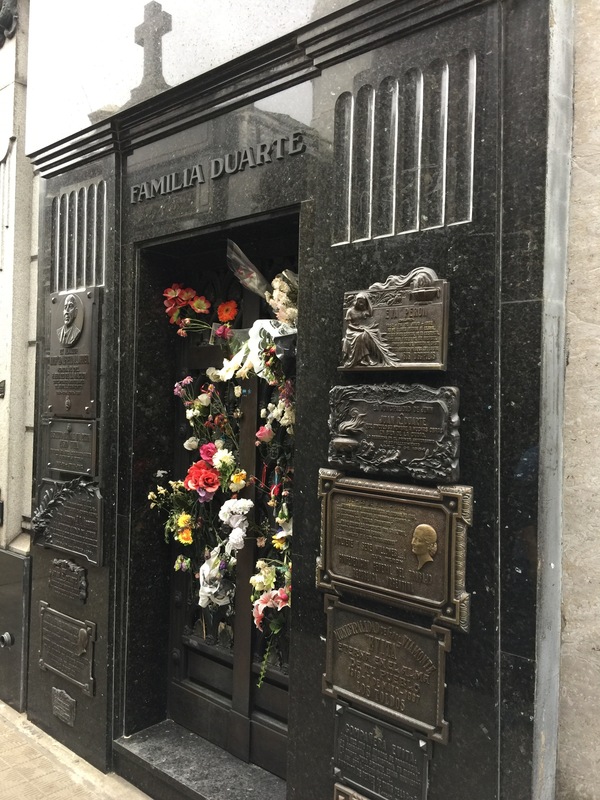 Entry is free and most tourists make a dash straight for the Peron Family mausoleum at Lot 88, where Evita is buried. 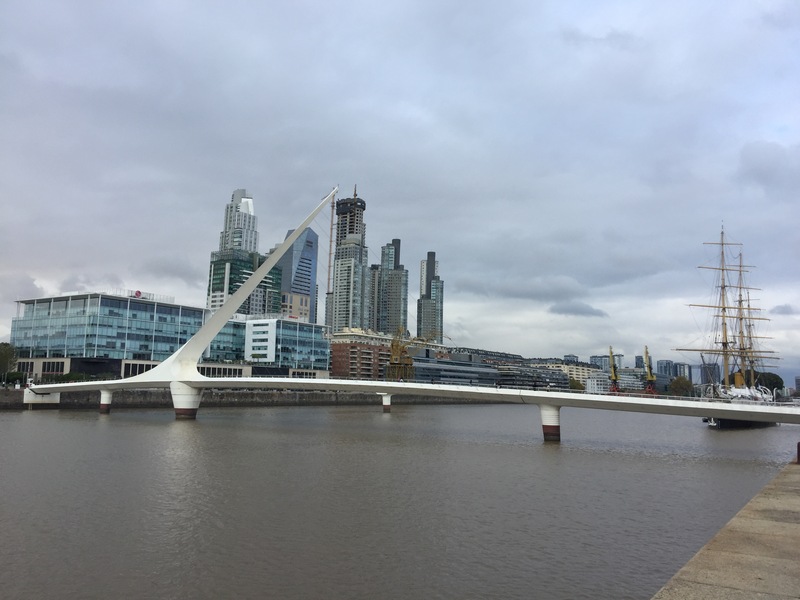 Located within a short walk of one another, the Floralis Genérica is a sculpture made of steel and aluminum located in Plaza de las Naciones Unidas, Avenida Figueroa Alcorta, Buenos Aires, a gift to the city by the Argentine architect Eduardo Catalano. 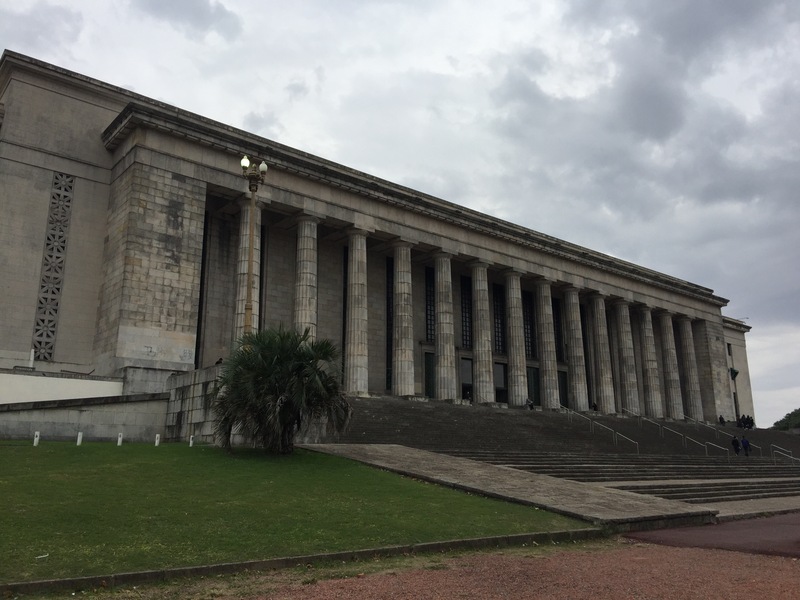 Opposite the Plaza is the University of Buenos Aires, the largest in Argentina with the impressive law faculty building. Nearby is the Museo Nacional de Bellas Artes which hosts an impressive collection including Rubens, Van Gogh, Rembrandt, Monet and Degas. Buenos Aires is famed for its nightlife which doesn’t get started until gone midnight. Luckily the locals eat and drink in equal measure so you’ll find plenty of good places to eat. Puerto Mouredo near the city centre sits on a canal with a number of Tall Ships and the ‘Needle Bridge’. You’ll find a good selection of large chain bars and restaurants. Plaza Serrano just outside of the city centre is a teeming hub of bars and restaurants with countless happy hour and 2for1 promotions. It’s good fun and reasonably priced.